The magazine is holding on tight to its Mass Effect 3 secrets, but some say it contains nothing but rumors. Rumors that Mass Effect 3 will feature some kind of multiplayer mode have been circulating for months, and while BioWare has denied them in the past, not everyone is listening. Now, UK magazine Xbox World is adding more fuel to the fire and claiming to have details on these fabled multiplayer features in its most recent issue. CVG suggests that the magazine will contain the first real details on Mass Effect 3 multiplayer, but doesn't have any information on what those details might be. Instead, it reiterates some of the rumors about the game, which claim it will have a Gears of War-style "Horde" mode, as well as death matches - both, individual and team - and capture the flag style gameplay. However, according to one commenter, reiterating rumors is all that the magazine does as well. Citing "various sources," the magazine supposedly says that Mass Effect 3 will have a series of three player co-op missions that run parallel to the main story, with each player will take on the role of one of the squad mates. The magazine apparently also covers its back in case the sources prove to be wrong, by saying that developers have been known to dump multiplayer modes if they don't work. It's impossible to say whether or not CVG - which, like Xbox World, is owned by the Future Publishing - knows what's in the magazine, but I'd be quite surprised if it didn't. If the commenter is indeed correct, and the multiplayer "details" are just oversold rumors, then there will a lot of people angry - and justifiably so - at being duped. 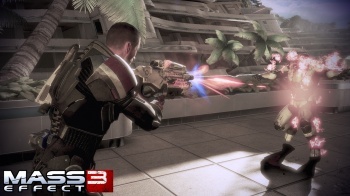 Mass Effect 3 comes out for PC, PS3 and Xbox 360 on March 6th.